On this week’s Supergirl Radio, your hosts Teresa Jusino and Rebecca Johnson discuss news about CBS’ Supergirl (including some of the critical praise the pilot is getting by press!) 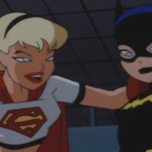 while also discussing Supergirl in the DC Nation animated shorts in “Super Best Friends Forever”. Join in on the fun as the gang at Supergirl Radio prepare for CBS’ Supergirl, starring Melissa Benoist! When designing these figures, where did you pull your inspiration? Faust: From real teenage girls! Each of these characters’ physiques came from girls I knew when I was young. When I was designing Supergirl, I was thinking of the girls in my high school who played field hockey. Their uniforms incorporated these short skirts, but their legs were all muscle! I found them so intimidating. Fun episode, though I ended up losing an hour rewatching DC Nation shorts! Looking forwards to Gates. I’m generally a fan of when a writer gets to do a long run on any character and really dig in. Okay, seriously? Latin American? It’s a Greek Accent. Because the Amazons were, you know, Greek. Wonder Woman is Greek. Greece is nowhere near any place that could be considered “Latin American.” There are other places in the world that are not immediately adjacent to the US. I get that many if not most Americans have a very America-centric world view and don’t pay attention to the rest of the planet. My grandfather was Japanese and when he answered the phone as a kid people used to say he sounded “Mexican,” for example. They said he “looks Mexican” too. But even though we don’t tend to care about the rest of the world it IS there. And it’s a big planet. The Americas only comprise one region of it. You talk a lot about feminism and female empowerment and that’s awesome but it seems to be white feminism that you’re concerned about and it’s not just that remark that makes me think so. Gender equality is something we definitely need to make happen but it can’t just be about that. There are racial and economic factors that are just as important and if those aren’t corrected as well then all the progress we’ve already made will be short-lived because those oppressive systems will still be entrenched in the mindset of society and things will revert to a decidedly less progressive status quo. Look at all the racial problems in the US now. We’re slipping backward. There are many more examples worldwide. We MUST stop being so self-centered and start being aware of the rest of the world. It’s the only way progress can be made and sustained.